﻿ Happy Birthday Beau ! Well, Beau's not seen the full 40 years, but you get my drift. Beau Peep first appeared in the launch issue of the Daily Star on 2nd November 1978. The Daily Star was the first national paper to be launched in Britain since the 'Daily Worker' in 1930 (and I'm told that Mr Kettle and Mr Christine had a cartoon strip in the first edition of that paper too). The very first Beau Peep strip. Two years ago next month, and after an incredible 11,270 (approx) strips, the Star dropped Beau. Thanks again, Roger and Andrew. I don't half miss the old devil. Re: Happy Birthday Beau ! I see that Roger and Andrew had much spikier hair back then. Perhaps Egon might forge a cake? Thanks, Rob---I just noticed this post. Seeing that first strip again brings back memories. I had absolutely no idea where the whole thing would go and was winging it as I went. We were given an initial 6-month contract and we were both delighted. Andrew and I were pretty much broke at the time and six months of guaranteed income was beyond our dreams! Have all the strips been made into books? I have books 3-19, The Colour Collection, The Return of Beau Peep and, thanks to Diane, a printout of Book 1. Looks like you have all bar one of the books Bill. 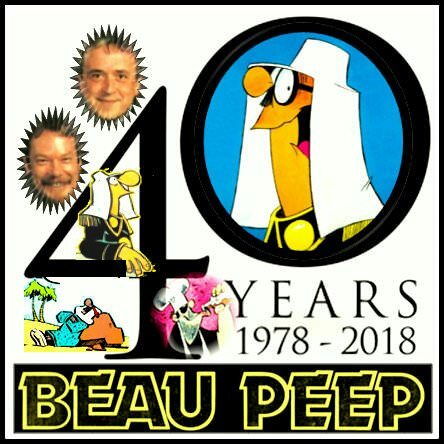 Twenty-one Beau Peep books have been published in the UK -- Books 1 to 19, plus the un-numbered 'Colour Collection', and 'The Return of Beau Peep'. Only Books 1 and 2 reprinted every strip from the Star since it's launch in 1978. The books thereafter only carried selected reprints. There's many thousands of strips lying in the archive unseen again since the day they were printed in the paper. They owe it to the world to let people see those strips online! I believe Rob has all the strips. They need scanning, cropping, cleaning up and putting online. It's a lot of work and not something any one person can or ought to do.